This chicken Marengo recipe is not only comforting and delicious but it can be on your table in a little over an hour!! My mom used to make this delicious recipe. I always thought it was her own creation. Little did I know that it was Napoleon Bonaparte’s chef who, after scrounging in a village for whatever ingredients he could get his hands on, came up with this recipe. I’m pretty sure this isn’t the original recipe because rumor has it there were crayfish and eggs in that first iteration. The chef later perfected the recipe by adding mushrooms instead of the the crayfish. He also added wine. It is said that this dish was named Chicken Marengo because it was first eaten by Napoleon after the Battle of Marengo. He liked the dish so much that he requested it be served after every battle. Notice I said, “requested”. I’m sure Napoleon asked most politely. During my research, I also learned that everything I just told you might be a myth; that perhaps a random chef in a restaurant somewhere made this to honor Napoleon’s victory. We will probably never know. I think I’ll go back to believe my mom made it up! Bring the pan of chicken Marengo almost to a boil and lower the heat to a simmer and cook it for 40 minutes! See how luscious it looks? And how all the ingredients melded together? When I was growing up, we had chicken Marengo on mashed potatoes. I choose to smother pasta with this delicious dish. Time to dig in. Christopher is one happy dude right now. 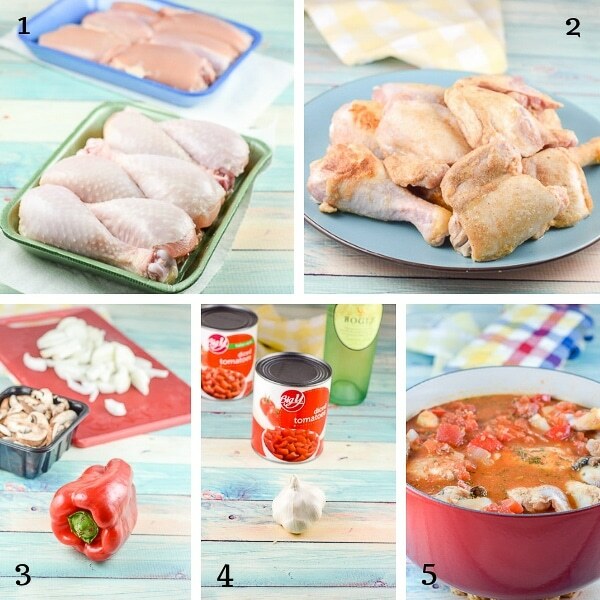 I hope you enjoyed this Chicken Marengo recipe. This dish is pure comfort food. It is so delicious and very easy to make! This makes a big pot of Marengo - calorie count is just for the Marengo, not what you serve with it, so for a thigh and 1 1/2 cups of the gravy. This looks extra delicious! I love any kind of stew or soup in the fall. For me this dish always makes me think of an old British comedy series called Red Dwarf, that was the first place I ever heard of this! Looks really delicious! Haha. That’s funny. I’ve never heard of that series. Thank you!! Ha! I love recipes with convoluted, possibly fictitious histories! I’m a big fan of chicken cacciatore too, so I can’t wait to try this to change things up a little. It looks amazing! Thank you so much. You won’t be disappointed. It is super delicious!! This looks amazing! 100% with you in the whole raw meat thing…yuk! Also 100% on board with the wine in this dish! I know my family will love it!!! I need to have this really soon! Looks delicious!